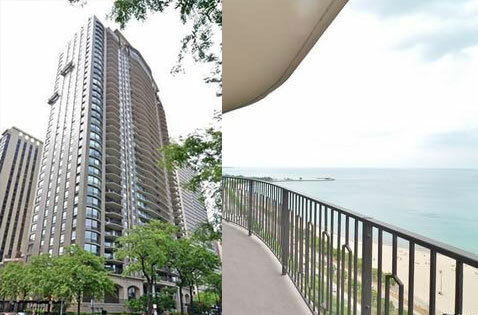 "1040 N Lake Shore offers very spacious floorplans - even 1 bedrooms are over 2,000 sq ft. Huge balconies overlooking Lake Shore Drive. No pets allowed - no cats, no dogs." 1040 N Lake Shore Drive - The Carlyle - is an attractive residential high-rise in Chicago's affluent Gold Coast neighborhood. Though The Carlyle was originally built in the mid-1960s it still retains its elegance and charm. The building is located just across the street from the lakefront and beach, and as a result, residents of the Carlyle have some of the best lake views in the city. Building amenities include a ballroom equipped with caterer's kitchen, indoor swimming pool, exercise facilities, rooftop decks, valet parking, 24 hour doorman, and His & Her steamroom. Many condos in 1040 North Lake Shore have been renovated over the years, so buyers have a wide variety of floorplans and modern finishes to choose from. Units also feature large balconies and leased indoor parking is also available. 1040 N Lake Shore Drive does not allow pets.